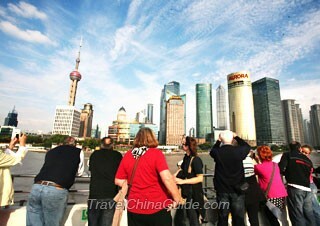 Upon your arrival in Shanghai today, your private guide will meet you at the exit of the airport arrival hall. 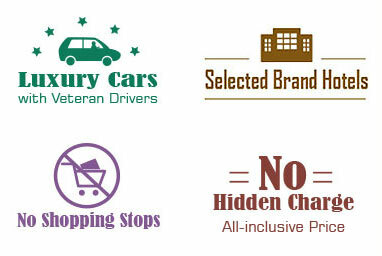 Our experienced driver together with his comfortable air-conditioned vehicle will then get you to the hotel. You will be free on your own for the rest of the day. Your private vacation begins with the Shanghai Museum, where you will learn some profound history and culture by appreciating its fantastic collection of ancient Chinese art. Later we will take you to the classical Yu Garden, a private garden of the Ming Dynasty. The nearby busy market which sells a variety of local snacks and small souvenirs also deserves your attention. An a la carte welcome lunch (valued at CNY150.00 per person and included in our price) is served to you at a fancy local restaurant. In the afternoon, we will take a short cruise on the Huangpu River for a visual spectacle of grand buildings on both sides. Later, we'll leave you some free time at the Bund. We will certainly see the flourishing and busy Nanjing Road before driving back to your hotel. Shanghai is not only known as a modern metropolis, it also has unique characteristics that belong to a city in the south of the Yangtze River. Today, we will drive out of the city to visit the graceful and picturesque Zhujiajiao water town. This small town has a long history with well-preserved buildings from the Ming and Qing dynasties (1368~1912). Enjoy yourself here with the ancient houses, stone bridges and lively streets. Lunch is arranged on your own. Later, we will transfer you to Shanghai Hongqiao Railways Station and you will take a 5.5-hour high-speed train to Luoyang. Our guide will meet you at the train station exit and transfer you to the hotel. 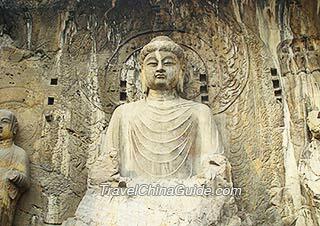 Today, we proceed to the Longmen Grottoes. These grottoes were constructed starting in the Northern Wei Dynasty (368-534), and the work continued for more than 400 years until the Song Dynasty. Lunch is on your own. We then drive for about 1.5 hours to visit the famous Shaolin Temple. The wonderful Kungfu show here is a highlight not to be missed. After that, we will transfer you back to the hotel. This morning you will board a high-speed train to Xian for a trip of about 2 hours. Comfortable transfers to and from the train stations are provided. Different from modern Shanghai, Xian is a famous ancient capital city of thirteen dynasties, which has much more to offer with its cultural relics and historic sites. 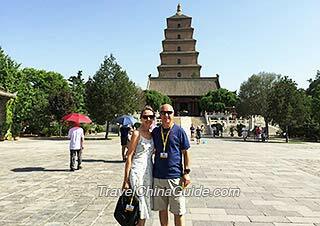 We will first pay a visit to the Giant Wild Goose Pagoda to learn something of the Buddhist culture, and then the Provincial History Museum to have a general idea of our brilliant Chinese history and achievements of ancient times. Today is a big day. 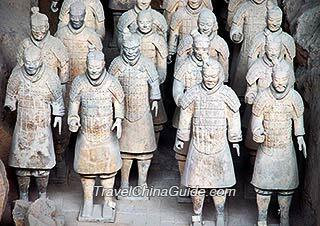 You will visit one of the Eight Wonders of the world, the Terracotta Army. We will set off earlier than usual and drive for about an hour to get to the museum. The Terracotta Warriors was an underground army built to protect the First Qin Emperor after his death. The funerary pits with a large number of life-size terracotta warriors and horses with different shapes and faces are marvelous. It is amazing to see something of high artistic value from more than 2000 years ago. After that, we will drive you back to the downtown area and stop at a local family's house. The hostess will prepare delicious home-cooked food for you, making it a very special experience. 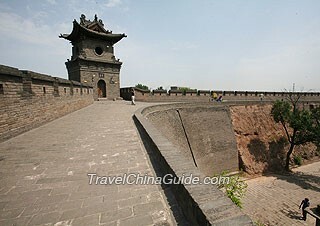 The afternoon is filled with visiting the ancient City Wall and the Great Mosque. Today we will proceed to the Ancient City of Pingyao via high-speed train. Unlike Xi'an, which has ancient buildings but also much more developed modern constructions and facilities, Pingyao is a well-preserved ancient city with complete city walls, lanes, yards and residences. After a three-and-a-half-hour train journey, you will arrive at this old town and be transferred to the hotel. In the afternoon, we will drive out of the city to visit the Wang Family's Compound. Covering an area of 250 thousand square meters, this huge architectural complex has 231 courtyards and 2078 rooms built along a hill. After breakfast, we have a full day visit to the Pingyao Ancient Town. The main sites we will see in the town are the City Wall, Ming and Qing streets, the Temple of City God, the Ri Sheng Chang Financial House and the Tongxinggong ancient bank bodyguards. With the help of our guide's explanations, you could easily imagine the people's life here in ancient times. If you have spare time, you could walk through the main streets and narrow alleys, where there are many shops with souvenirs, restaurants and hostels on both sides, in a town full of bustling activities. We conclude the day at the Shuanglin Monastery. This morning we will drive you to the Pingyao railway station, where you take the high-speed train for about 3 hours to our capital city of Beijing. With a history of more than 3000 years, Beijing has seven World Cultural Heritage Sites, more than any other city in the world. 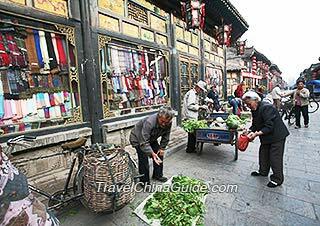 Upon arrival, we will pick you up at the train station and take you on a short Hutong tour by a rickshaw before you check in at the hotel. 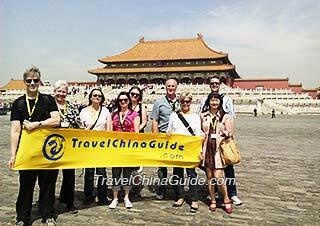 Your excursion today starts in the heart of Beijing, at Tiananmen Square. This is the largest city center square in the world. Stay a short time here for some photos and then we proceed to the Forbidden City. The grandiosity and solemnity of this architectural complex is tremendous. We will spend around 2 hours here walking through the palace halls and gardens, imagining the life and work of those emperors. After that, you will have an a la carte lunch (valued at CNY150.00 per person and included in our price) at a nice local restaurant. In the afternoon, you will have a leisurely visit to the largest imperial garden - the Summer Palace. This morning we will visit the Great Wall at Mutianyu, the centerpiece of all Beijing trips, with the round-trip cable car. Lunch is not arranged today. You may have some fast food at the suggestion of your guide. After that, we will transfer you back downtown. You will have a stopover on the way to take some photos of the Bird's Nest (Olympic National Stadium) at a distance. For the rest of the time, we will visit the Temple of Heaven, a place for emperors to pray for the country's prosperity and peace. The tour ends when we transfer you back to the hotel. Your private guide will meet you at the hotel and transfer you to the airport based on your departure flight schedule. We hope you had a pleasant journey with us. My son (18 years old) and I intend to visit beautifull Beijing shortly for a city trip. The stay will be less then 6 days and we will depart from Amsterdam, the Netherlands (country A), fly to BJ (country B) and then return to Düsseldorf, Germany (country C). Would we qualify for transit visas / 144 hour visa exemption in BJ? Make sure the flight to Germany does not land in Netherlands and has no other landings in China then this will be ok for 144 hour visa free transit. We are Canadian Citizens and have a 20 hour layover at PVO [Shanghai] during our flight by China Eastern Airlines from Toronto to Delhi [India]. Can we go out for a city tour without a visa? Do we have to apply for 72 hour visa free transit? Yes, you can go out for a city tour without a visa. Just apply for the 72 hours visa free permit at the airport. I will arrive at Shanghai Pudong International Airport at 5AM. I need to travel to Tangshan New Town, Jiangning Dist., Nanjing. what is my best option and how much time will this trip last? Upon landing at the airport, you may take the metro line 2 to Century Avenue Station after going through the immigration procedures. After that, you may transfer metro line 4 to SH Railway Station, Exit 6. The first metro departs at 06:00 from the airport and this metro ride will take about 75 minutes. Then you may walk about 150 meters to SH Long-Distance Bus Station. Later, you may catch a long distance bus to Nanjing Bus Station which leaves at 09:30. The ticket fare is CNY105/person and the whole trip may take around 3-4 hours. Upon arrival, you may walk to Nanjing Railway Station to take metro line 3 to East Mozhou Road Station, Exit 3. Then please walk about 340 meters ahead to Shuanglong Avenue Mozhou Road Bus Stop. Later, you can take bus no.851 to Tongshan Bus Stop directly. This section may take around 3 hours. Hello Concern's This is Wasim Im doing job in Dubai and i have Chinese Friend here she want me to go with her on 14days visit to china can you please guide me, what documents and process should i follow? Hi, you can come to the local chinese embassy to apply for the visa. Before that, you should prepare the application form, your passport with at least 6 months remaining validity, a passport-size color photo and invitation letter. There are 2 train station at Luoyang? One is listed as Luoyang and the other is Longman station? What is the difference? Usually speaking, Luoyang Longmen Train Station is for the high speed train and bullet train, Luoyang Train Station is for other traditional train type.